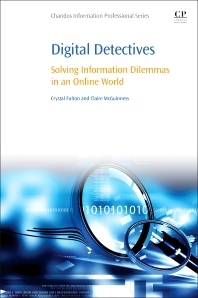 Digital Detectives: Solving Information Dilemmas in an Online World helps students become independent and confident digital detectives, giving them the tools and tactics they need to critically scrutinize web-based digital information to ascertain its authenticity, veracity, and authority, and to use the information in a discerning way to successfully complete academic tasks. Enabling students to select and use information appropriately empowers them to function at a higher level of digital information fluency, acting as discerning consumers of, and effective contributors to, web-based information. Undergraduate students, especially those transitioning from secondary school to university or college. 1.3. What Can I Learn from This Text? 2.1. What Is Digital Literacy? 2.2. Learning at University: Where Do I Start? 2.4. How Can a Digital Context Enhance My Learning? 3.2. Can I Just Google It? 3.5. How Does Google Decide the Order of the Search Results List? 3.10. How Do I Become Google-wise? Chapter 4. Wiki or Won’t I? 4.2. What Is Collaborative Authoring? 4.4. How Does Wikipedia Work? 4.5. Who Is Behind the Articles on Wikipedia? 4.6. How Do I Know If the Information Is Accurate? 4.7. But Wikipedia Provided Great References. Can’t I Use Them? 4.8. How Can I Use Wikipedia for Academic Assignments without Getting Penalized? 4.9. Could I Contribute to Wikipedia Articles? 5.2. How Do You Select Digital Resources to Use in Your Coursework? 5.3. Why Evaluate Digital Sources? 5.4. What Is Different about Information on the Web? 6.2. Who Owns Digital Information? 6.3. How Do People Protect Their Digital Creations? 6.4. How Do I Ethically Use This Information in My Work? 6.5. Where Can I Find Information That I Can Use Freely? 6.6. How Do I Attribute a source to Its Creator? 8.1. The Dilemma: Searching Is Searching, Whether You’re on the Web or Using One of the Library Databases, Right? 9.2. What Do We Mean by Social Media? 10.3. Reflection: How Safe Do You Feel? 11.3. Why Does Online Reputation Management Matter? 11.4. What Is a Digital Footprint? 11.5. How Are Data about You Collected Online? 11.6. Who Wants Digital Data about You? 11.7. How Do I Appear on the Internet? 12.9. How Will e-Skills Help Me after University? Dr. Crystal Fulton is a Senior Lecturer in the School of Information and Library Studies, University College Dublin, Ireland, where she teaches in the areas of information literacy, information and public services, information behaviour, and social computing and media. Her teaching takes a collaborative, problem-solving approach, aimed at promoting self- constructed learning practices to help students become more independently analytic. She introduced the teaching of qualitative research in her school, as well as new and interesting classroom techniques and assessment to encourage student engagement in learning. She created and teaches a unique course, Learning to Teach, Teaching to Learn, to help doctoral level students across the university develop best teaching practices for the classroom as well as a teaching e-portfolio to document their progress. She has also taught in Germany under the ERASMUS programme. She has long used blended and fully online teaching and learning, pioneering her school's first course to be offered completely online.She was the co-Principal Investigator on Creating e-Practicums to Enhance Undergraduate Learning, a project funded by the university to introduce reusable digital learning objects in the school. She recently won the UCD President's Teaching Award (2010-2012) for excellence in contributions to teaching in the university. In 2011 she was one of only two members of UCD nominated for the prestigious National Awards for Excellence in Teaching (NAIRTL). As her school's Director for Teaching and Learning for five years, she has been responsible for managing and supporting the development of teaching policy and practice in the school. She has delivered papers at international conferences on teaching and learning, and she has published in this area. Her book, Information Pathways: A Problem-Solving Approach to Information Literacy, was published in 2010. Claire McGuinness is a part-time lecturer in the School of Information and Library Studies, University College Dublin, Ireland. She has been teaching and researching information literacy for more than a decade, and was awarded a PhD. in 2005. Claire has published a number of articles and book chapters on information literacy and academic-librarian collaboration, and has presented her work at several international conferences. Currently teaching two information literacy-oriented modules at undergraduate and postgraduate level, Claire is also a member of the Working Group on Information Literacy of the Library Association of Ireland.